Knowledge is power on Chapter 8 Page 3. Snow-by-Night is bound as Bertrande prepares to extract her aether. To see a preview of the next page, please vote for Snow by Night on Top Web Comics. So Blaise’s commentary about everything being uphill was drawn from Brittany and my experience in Québec. Our friends were kind enough to drive us downtown to see the Old City. We left the car and went uphill. That evening, we walked uphill to get back to the car. Brittany and I looked at each other and said, “Wait a minute… how… what? Is this city built on a giant möbius strip that is always going up hill?” Apparently in Québec, you can go uphill both ways to walk to school. Oh, and you will be walking through the snow. I saw Thor over the weekend. I enjoyed it a lot. I was particularly entertained by the Norse in Space artistic style they had through most of the movie. The blending of the fantasy and science fiction elements together reminded me lot of the old ’80s movie Krull. I haven’t seen Krull in a long time so I don’t know how well it stands up, but something about the artistry of Thor kept reminding me of some of the fun ’80s fantasy movies with much better special effects. 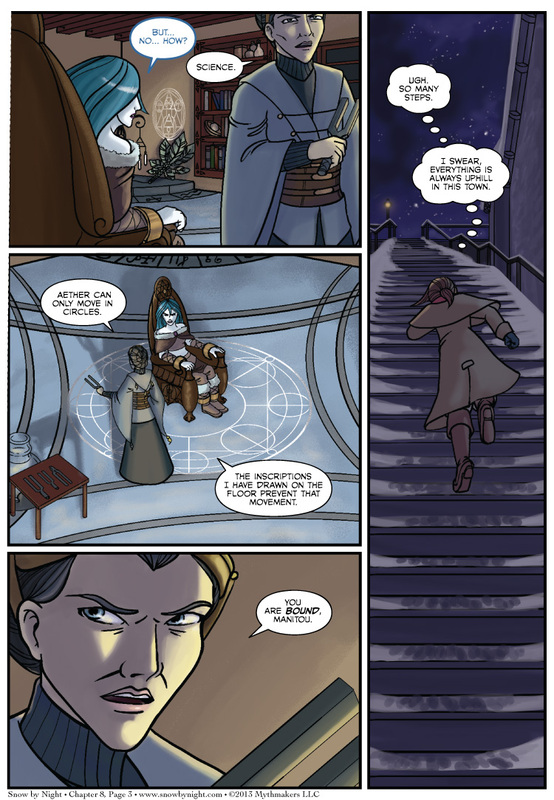 The SpiderForest Webcomic of the Week is Supervillainous. It’s a relatively new webcomic of a super villain who is trying to juggle work and family life. If you like a satirical look at the superhero world from the villain’s point of view, this comic is for you. Also, we have our call for fan art. Snow by Night will on a brief hiatus over the holidays. We would be more than happy to post any fan art during that time. It’s a great way to get notice for your comic or portfolio. Send any inquires to me at eric (at) snowbynight.com. Thanks!